Late Woodland Mississippian, Reed points are less common than the Scallorn notched point. 28.6 mm x 15.5 mm x 2.9mm. The study of the human past is divided into two general periods of time: prehistory and history. Normally, prehistory refers to the time before written records. However, this simple system of categorization is not entirely accurate. In Missouri, history is typically considered to have begun with the earliest settlement of Euro-Americans who sustained contact with and wrote about local Native Americans. The prehistory of Missouri is divided into four broad stages (Paleoindian, Archaic, Woodland, and Mississippian) and each of those is divided into three periods (Early, Middle, and Late). The distribution of archaeological remains in this area is directly linked to the ways human groups structured their everyday activities. The prehistoric period within the area where Wilson Creek meets the James River has not been as abundantly examined as the historical era. Most prehistoric sites within the locale are represented by scatters of stone tools and other debris that cannot be dated. However, a few sites provide insight into the regional prehistory of this area and the people who lived during those times. Various sites have yielded evidence of prehistoric occupation ranging from the Paleoindian, which dates to approximately 13,000–12,000 before present (BP) to Archaic (12,000 – 3,000 BP) to Woodland (3,000-1,100 BP) through Mississippian (1,100 – 400 BP). The Jameson site is located in the Delaware Town area and exhibits stratified or layered deposits of artifacts descending to four meters below surface. Three projectile point types have so far been recovered from various strata or layers at the Jameson site. These consist of: Packard, Graham Cave (Early Archaic) and Smith (Late Archaic). The occurrence of the Packard point indicates a likely Paleoindian component. It is assumed by some that Packard points immediately preceded late Paleoindian Dalton points; however, others consider Packard to date later than Dalton. Additional materials were located below the 3.35 meter depth of the identified Packard point, which suggests those artifacts date to the Paleoindian stage. Projectile point found in excavation unit at site 23CN1. Two radiocarbon dates were obtained from charred material in alluvial sediments that contained the Graham Cave projectile point, dating to the Early Archaic period. A charred acorn nut meat dating to 8320+/- 40 BP was found above the Graham Cave projectile point and a Graham Cave preform. A piece of wood charcoal dated to 7800+/- 40 BP and was located below the Graham Cave artifacts and acorn nut meat. Paleo—environmental evidence show that the Archaic period was a time of dynamic ecosystem change, resulting in shifting distributions of food resources. The people during this period were forced to adapt as well. During the Early Archaic, the people are thought to have pursued a generalist foraging strategy, meaning they gathered whatever resources were abundant in their environment. 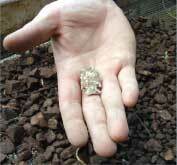 Projectile point found while screening soil from excavation unit at Bell Tavern during 2007 Summer Field School. A concentration of Middle to Late Woodland artifacts is present at the Delaware Bridge Cairn site. Burial mound construction is one characteristic of the Woodland period. These mounds sometimes contained grave goods, often made of exotic materials showing evidence of trade. The presence of mounds implies that cultural groups were more sedentary and likely adopted small scale food production. However, many archaeologists believe that Woodland peoples in this region continued to rely on hunting and gathering for their primary subsistence. The Delaware Bridge Cairn site contained a burial (Feature 3) with nine Anculosa snail shell beads found in the vicinity of the individual’s neck. Their presence indicates trade in exotic goods. The shells most likely originated from the freshwater river systems of the Southeast. Projectile point fragment found in unit during 2006 Summer Field School. Another feature (Feature 1) contained charred human bone fragments found in association with five disc-shaped shell beads. In addition, two undecorated pottery sherds were found in this feature. 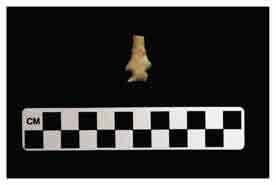 Along with a polished bone awl, a corner-notched projectile point crafted from Pitkin chert was discovered in the locality of the bones in Feature 1. Four projectile points from Feature 6, a bundle burial with associated stone artifacts, were also made of Pitkin chert. The presence of the Pitkin chert type is significant because it is found in northwest Arkansas, not southwest Missouri. The Mississippian period is represented by a component identified in Area B at 23CN1. Shell-tempered pottery, Scallorn arrowpoints, and a hearth were excavated by the 2005 MSU Archaeological Field School. The Neosho phase is an archaeological complex occurring during the Late Mississippian period. It appears about A.D. 1300-1350 and fades out around A.D. 1600-1650. This complex is believed to represent Caddoan influences on the material culture of peoples living in southwest Missouri at that time. In particular, the Kadohadacho Caddo, whose large villages centered on the Red, Ouachita, and Arkansas rivers in north Texas, eastern Oklahoma, and western Arkansas, are thought by some to be the historic descendants of earlier peoples of the Neosho phase. The Kadohadacho had a chiefdom society that practiced primarily agriculture, but also fished, hunted, and gathered plants. They grew crops of corn, beans, and squash. Their language is closely related to that of the Pawnee and Wichita tribes of the central Plains and it is thought that they were previously one group. Archaeologically, Neosho materials include flat-bottomed ceramic vessels of the shell-tempered Neosho Punctate and Woodward Plain types; Fresno, Scallorn, Huffaker, and Nodena arrowpoint types; Harahey knives; and end scrapers.